Basements, which are made up of exposed concrete and have little to no natural light, are cold and unfeeling spaces. Softening a basement with textiles will go a long way toward transforming the room into a comfortable environment. One site for such a fabric treatment is the ceiling. Draping the ceiling with fabric keeps wall space clear and helps to cover unsightly features such as pipe work or ducts. Fabric can soften a sterile basement. Measure the dimensions of the ceiling area you would like to cover. Acquire, cut or sew together a square of fabric that is 3 to 6 feet longer and 3 to 6 feet wider than the ceiling dimensions. How much extra length depends on how low you want each drape to hang. Hem two of the ends. Fold over the two remaining sides 3 to 4 inches and sew down the ends to create loops that run the entire length of the edges. Pinch up and pin together a 3 to 4 inch crease down the center, on the underside of the fabric, running it parallel with the loops. Sew along the base of the crease to create another loop. Insert a drapery rod into each loop. 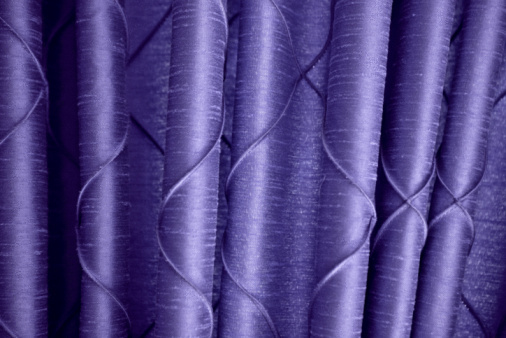 Use drapery rods that are 4 to 6 inches longer than the looped sides of the fabric. Measure and mark the points on the ceiling beams or studs just outside where the corners of the fabric will be positioned. Also mark the halfway points between the corners, corresponding with the placement of the center loop. Screw hooks to the marked points. Rest the dowel ends protruding from the fabric's loops into the hooks.